Well what ever that magazine is, will be a decision you will have to live with for several years, especially if you reach your goal. I say that, because there is an unwritten law in the Fashion Industry that goes something like this. Now there are exceptions to the rule, but, until you are the next Richard Avedon (May He Rest in Peace), this law is pretty universal. If you are about to say yes to working with let's say, "...." Magazine Spain, chances are that their competition in Spain "......... .............." Magazine will not consider you, unless you have something so amazing in your style and have access to all of the Top Celebrities and Models in the world, they will probably take a pass for now. There are several exceptions to this rule of course. One of them is that another magazine with a considerably higher status decides to forgive your indiscretion in you choosing to work for that other magazine and forgive your misaligned direction. Or the person who hired you to work at that magazine moves on to another magazine of greater or lesser repute, let's hope it is the later and decides to bring you along. Or the publishing group who owned that magazine you chose to work with has decided to buy out another very important magazine and allowed one or two of those privileged photographers to migrate to that more up style magazine. Awe WTF...if you want to shoot for ELLE, go for ELLE. If you are aiming for Marie Claire, go for Marie Claire. The same goes for all of those great magazines like Numero, W, Vogue, Harper's BAZAAR L'Officiel, Tatler, Vanity Fair, etc. You get my gist. It is not easy to migrate. Trust me, I know from experience...I Really know from experience. So when you are planning your future, set your goals and go for them. Do not look in any other direction than your set goal. At some point in the road, you may decide to park elsewhere. But until that time, Bon Voyage. Do you find that there's certain advantages or disadvantages that magazines look out for? - Magazine X has a definite prefence for photographers with a film background and can still work well with film if required. - Magazine Y is very ingrained in the Nikon, Canon way, or only pick people using larger format gear .....etc and that way of doing things and won't look at others who shoot the "wrong" brand. 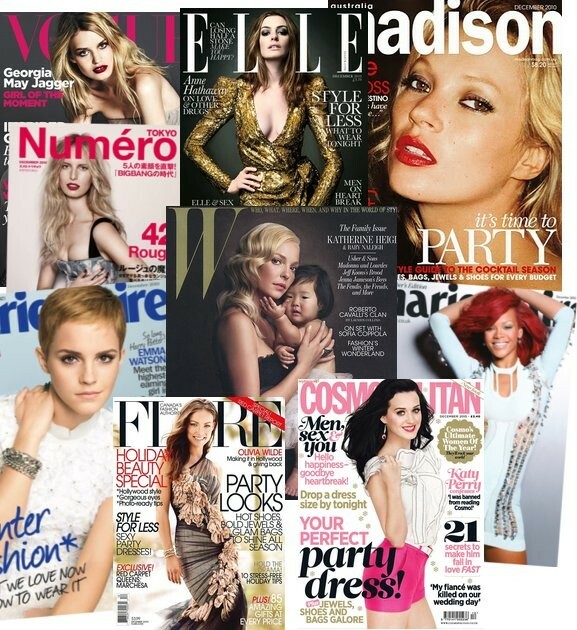 - Language and cultural backgrounds, do they make a lot of difference between magazines and who they hire? - Magazine Z prefers talkative, outgoing extroverts whilst another mag' prefers quieter phots who just get on with it. It may be all well and good to set my sights on Magazine A for example, but am I shooting myself in the foot when Mag A is after someone completely different and I'd have a much better chance aiming for Mag B who traditionally hire people more like me and my style. If that's the case, how do you research this stuff? Contacts, contacts, and more contacts. You really need inside info and contacts these days. I tried to get my work submitted to a famous publisher in Europe (name withheld) and they wouldn't accept it until I had a contact in New York, who in turn gave me their contact person's name at the publisher in Europe, who I was able to send my submission to. I probably wouldn't have even had a chance at my images being seen otherwise.